One of the best ways that you can help your children become familiar with the message of the Bible is by catechizing them. That historically proven method of instruction encourages not only children but also adults gain a helpful, systematic understanding of what the Bible principally teaches. How soon should you start? Sooner than you think! Under normal circumstances, even very young children can memorize the answer to basic questions about the Christian faith. I have heard “God made me” echo from the walls of toddler classrooms in churches. I’ve also had the privilege of hearing my own children–from very young ages–recite plain answers to simple, important questions from God’s Word. I’ve also listened to adults who were well-catechized as children reason biblically using the doctrinal framework they learned decades earlier. Jonathan is 2 years old. He is singing a tune from the Jim Orrick’s CD, The Baptist Catechism Set to Music. 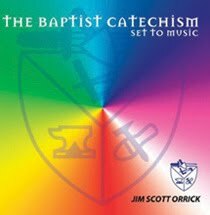 Dr. Orrick has taken all 114 questions and answers of the catechism and made them singable. The two CD set contains an hour and 48 minutes of memorable tunes. 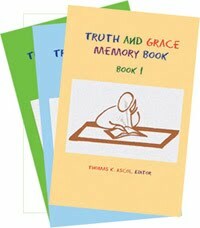 Another resource that can help parents in the work of c atechizing as well as encouraging children to memorize Scripture are the Truth and Grace Memory Books. There are 3 books in the set, each arranged around a different catechism and selected Scriptures and songs to be memorized. The books may also be purchased separately. If you are a parent with young children in your home, don’t miss the opportunity to teach them God’s Word systematically through a good catechism. If you are a pastor, encourage your parents to take up this challenge. Ten minutes a day will be time well-invested and can help provide a foundation for a lifetime for young ones.